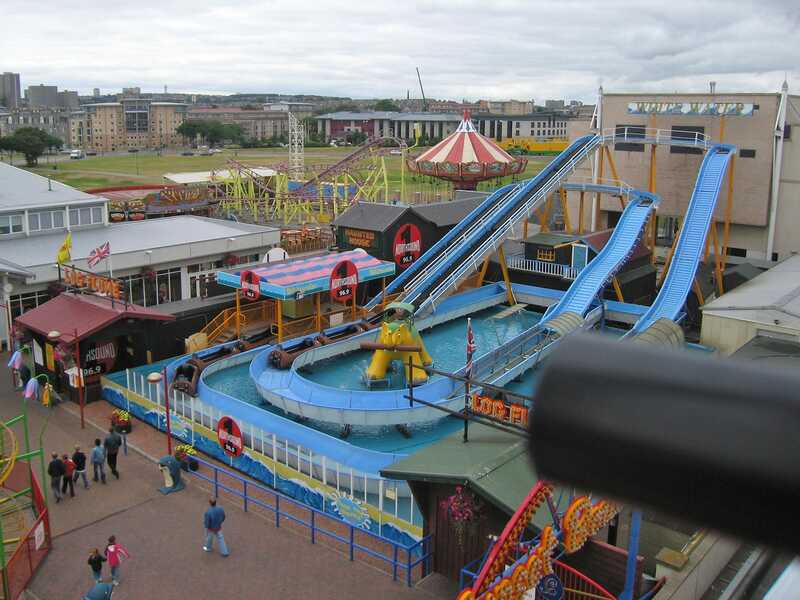 Codona's Amusement Park is located in Aberdeen located in the north-eastern Scotland. We'd been in the place for no more than five minutes before one of the staff members came over to tell us off; apparently taking photographs of the various attractions found within was against the rules, a nonsensical restriction given that the park sells custom branded disposable cameras in its gift shop. It was tempting to politely enquire whether those were fitted with a locking system preventing their use within the park boundaries, but I decided instead that I should hold my tongue until I'd ticked off my credits. The most interesting coaster in the park is Crazy Train (#507), one of three operating installations of the Pinfari MMM29 coaster and in my not-so-humble opinion the finest model to come from that company. The train runs smoothly no matter where you sit, just like the version at Adventure Island, and the compact footprint makes for an enhanced sense of speed. Better yet, this installation is operated with riders getting two circuits per go, which is a nice touch in a park that offers a pay-per-ride option. The only real negative was the incredible thirty-four seconds that it took for the train to get from the brake run back to the station at the end of each lap. The park, however, does its utmost to stop people riding their star attraction, with a load time of exactly six minutes by my stop watch. During this time, the operator did not check rider restraints, and there was a queue (a short one, to be sure, but a queue nonetheless) of people waiting to board. 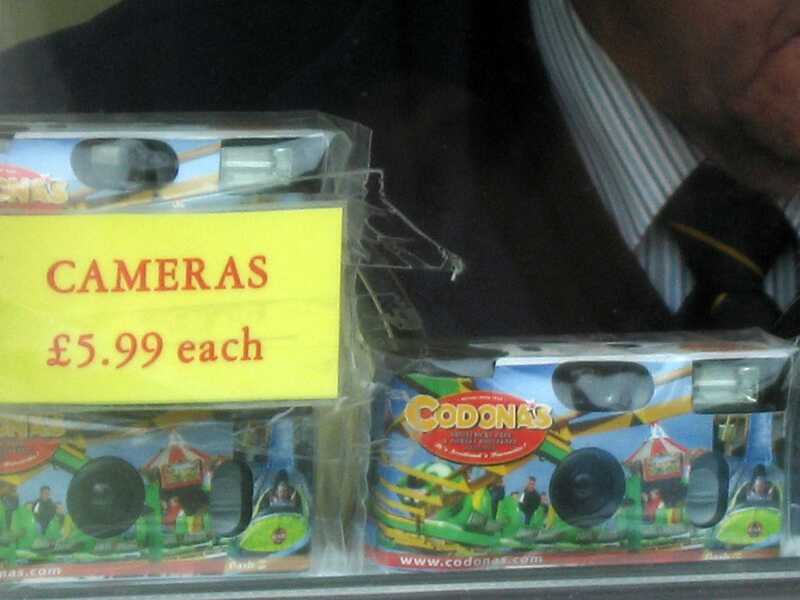 I found myself wondering whether this was the reason that the park did not want photography, as videos of their appalling lack of efficiency could frighten off potential visitors. The two hour unlimited ride wristbands that we'd purchased began to look less and less impressive as time clicked on. Loading on the kiddie coaster, the Big Apple (#508) was only marginally more impressive, with a total time of four minutes, again with a queue. It was hard to figure out what the ride operator was doing to make the process take so long, as it looked to us like everyone was boarding without fuss. The coaster was an interesting challenge for me to fit in, though I managed it eventually. Martin put things quite well; You'd think this ride was designed for children, wouldn't you? It is impossible to say whether it was due to the weight in the train or due to dodgy maintenance, but for whatever reason the train overshot the station when our ride came to an end, with three rows of riders out on the track. It is normal procedure on many such rides to push the train out on to the circuit to get it going, but never before have I seen a case where the train had to be pushed back into the station at the end. The third and final coaster, though named after one of Schwarzkopf's finest designs, was another Pinfari. Looping Star (#509) had the fastest load time of the three coasters in the park, a sluggish two minutes per train. We rode twice, once at each end of the train, and in all honesty I'm really not sure why. Once would have been enough; the older Pinfari designs are an acquired taste, one which I have not managed to acquire. In defiance of stupidity, we all took our cameras out again when riding the Grampian Eye ferris wheel, careful to disguise them again as we passed the base. From here we could see that the White Water log flume had opened, and Martin suggested we should give it a go. As the standard portable version (with plexiglas shields), this was never going to be a dry flume. It wasn't even particularly exciting; all it really served to do was to leave me squelching around in a wet shoe for the remainder of the day. I should have known better. The Splash Canyon dark ride was a very odd experience. The front of the building was covered with advertisements for different brands of cigarettes (highly appropriate in a children's park), two Irish street signs, four vehicle license plates showing the same registration (IAZ 8555), and a warning sign which proclaimed importantly that "It is dangerous to remove your seat belt". If anyone from the park is reading this, I would really appreciate an explanation as to why. If nothing else, the belt was very loose on me, and would not act as a restraint device even if I wanted it to. The experience itself was short, dull, and evidently very low budget. The last scene had the word vampire, presumably for those who couldn't figure out what it was that they were supposed to have been scared by. The effect might have worked better if the word had been spelled correctly. There was nothing else of consequence in the park for us to ride, so we finished up our visit with two more rides on Crazy Train. The ride had warmed up quite nicely and was running faster than earlier in the day, even if operations were just as slow as before. Before leaving the area, we went for a walk through the fields outside the park, where there were plenty of opportunities for photograph. The staff member who had chastised us earlier looked on in consternation, but as we were now on public property there was nothing he could do. 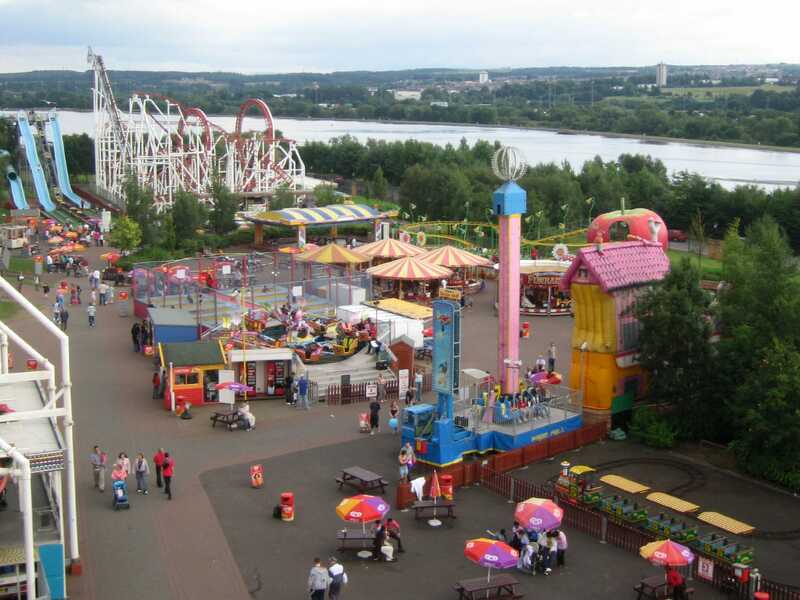 Our original plan for today was to visit Codona's Amusement Park followed by Blair Drummond Safari Park, a location that RCDB said featured a small coaster. We did call into this location, as it was more or less on the direct route we would have been taking anyway, but there were no fairground attractions of any kind, least of all a coaster. This meant that our visit was considerably shorter than expected, causing us to arrive at our overnight hotel nearly three hours before M&D's was due to close. With that in mind, we elected to utilise our pre-booked tickets, figuring that we could make a second visit in the morning if we ran out of time. We had little choice but to make Tornado (#510) our first stop. The ride is one of two installations of the largest coaster design ever created by Pinfari, with three inversions, two vertical loops and a corkscrew. Large Pinfari coasters are not known for their comforts, and with that in mind Martin and I went directly for the back row, the rationale that if we were only going to ride once we might as well get the full experience. The first drop proved quite a surprise, with perfectly smooth tracking and a fine turnaround into the two consecutive vertical loops, both of which were taken easily with no headbanging at all. I had just begun to think that maybe this might turn out to be a good ride after all when things went rapidly to hell. A not particularly fast corner was so jarring that I felt like someone had thrown something heavy at me, but worse was to come. The entrance to the corkscrew looked like a horribly twisted piece of track, with no precision engineering whatsoever. It felt like I was experiencing a train crash. The pain and jarring continued for what felt like an eternity before we hit the brakes, with everyone on board breathing a sigh of relief. With the Big Apple (#511) cleared, we made our way over to the coaster formerly known as Tsunami, since renamed Vortex in deference to the events in Thailand at the end of last year. It was unfortunately not operating, and as far as we could see had no chain on its lift mechanism, making it extremely unlikely that it would be opening later in the day. While it was a pity to miss out we took comfort from the fact that all of us had ridden it before at the Nottingham Goose Fair. The Ferris Wheel was the second ride in the park that appeared to be in serious need of maintenance. There were some very unsettling mechanical clunking noises coming from the base of our car as the wheel rotated, and these were synchronised with the car rocking alarmingly, in a way that the designers could not possibly have intended. As if that wasn't bad enough, the floor of the car was positively revolting, with an accumulation that smelled faintly of vomit mingled with chewing gum. Our shoes stuck to it, rather like two pieces of velcro might stick to one another. None of us were sorry to disembark, even if it had been the only way to get a decent photograph of the park layout. After a brief ride on the Free Fall attraction we decided we were ready to leave, less than ninety minutes after we had entered the park. Martin, in his infinite wisdom, suggested that we finish up with another ride on Tornado. Unlike the log flume earlier in the day, however, he got his payback this time, with a loud cracking sound coming from his shoulder that he informed us was still painful later in the evening. He wasn't the only one though; the ride left me with a lingering headache. I am aware that occasionally people judge parks based on my ramblings, making me hesitant to say something like this, but in my view Tornado should be removed from the park before it seriously injures a guest. Let the rider beware.